So NYC has just been hit by the massive hurricane Sandy this week and my heart goes out to all the families whose houses washed away, burned down, or facades flew off during the storm. Thank you to all the first repsonders and medical emergency staff that has put in so many hours to make sure everyone is safe. We were lucky and the UES had relatively little damage to the area, even though some street lights and trees came down, as well as a lot of wind damage. This was a horrible storm, and we just hope that the construction crews and insurance companies will do what's right, and will fix/pay for all the damages that have occurred in a timely manner. 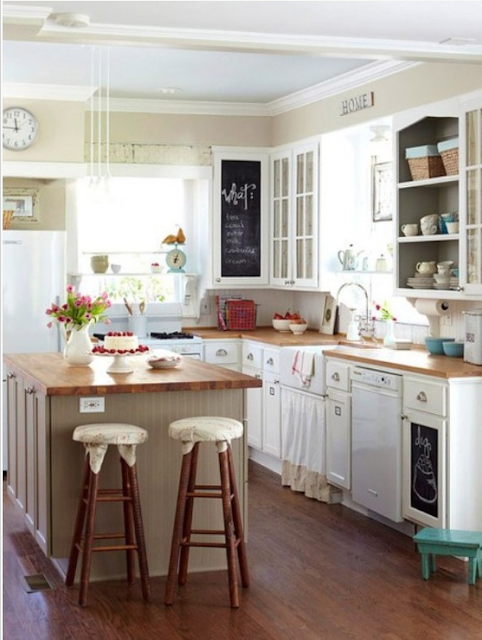 I thought this nice, roomy, organized kitchen could be an inspiration to some of the people who may need to re-build. Note the well placed island, the use of chalkboards for notes and shelving baskets to keep organized. I feel like this would be a good kitchen for baking, as it does actually have a lot of counter space and everything seems to be pretty accessible. Even the covered bar stools are a cute touch. Of course a freshly decorated cake and tulips are optional, but what a nice ambience!